I arrived five minutes after they opened, but the fourteen seats were already taken and there were seven people in line ahead of me. 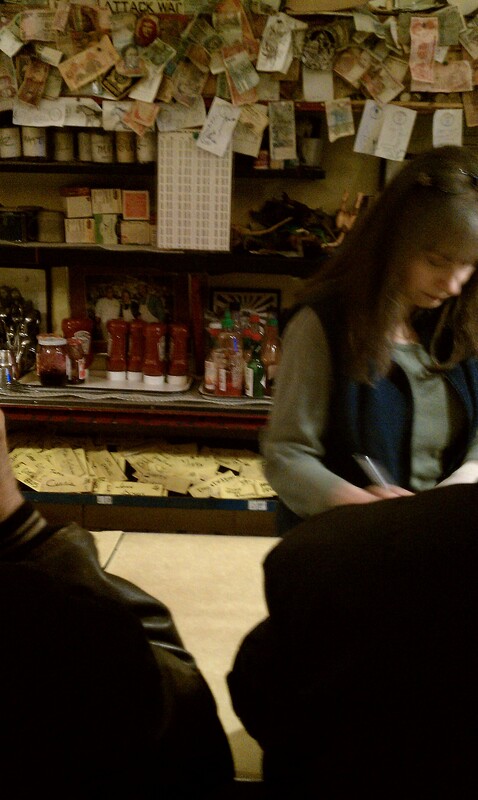 Oh, and by line, I mean standing against the wall which is about a foot and a half behind the stools. Personal space isn’t allowed in here. Though there were only twenty or so people in this tiny restaurant, there was a great mix of the young and old. It made for an interesting vibe to see them were bumping elbows with each other, quite literally at times. The cramped nature also allowed for great eavesdropping. I was able to find out that one of the employees was having their house inspected, but a different employee’s uncle was the inspector. Being able to hear the conversations made this place seem very homey, very much like a small town diner, not a place you’d find in a major metropolitan city. The casual way in which people were talking with one another was also a nice change of pace. You weren’t allowed to have your own bubble; your own place to turn the rest of the world off and focus only on yourself. You are forced to interact with people next to you. If you aren’t okay with that, you aren’t going to come back here. As time went on, a line began to form behind me. There was a couple waiting in line together ahead of me, and as a stools opened up, people that were already sitting were told to move over to allow the waiting couple to sit next to one another. The people already eating were not asked to move stools; no no. They were told. But given the limited space, it just seems like the right thing to do. Why can’t someone move down a stool or two so that these people can sit next to one another? The waitress was just basically being the voice of reason. After about a half hour of waiting, I was told to sit down on a stool that opened up. I look through the menu, which I’m sure hasn’t changed in years, and ordered a bacon and cheese omelet with toast and hash browns, plus OJ and coffee. After ordering, I had time to look at the opposite wall. They had plenty of cartoons, pictures, and other random crap hanging up on it. Most noticeable, though, was two rows full of yellow booklets with names on them. 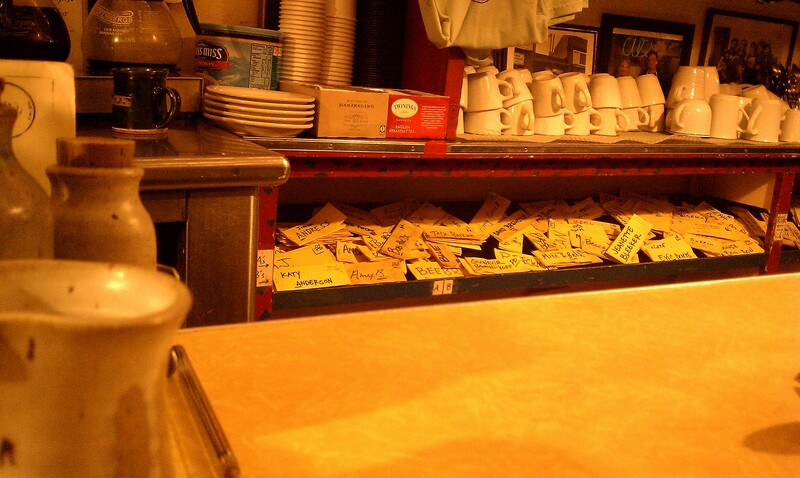 Apparently, when the restaurant first opened over 60 years ago or so, the owner would let people buy meals in advance on these kinds of booklets. They still allow people to do that to this day (oh yeah, no credit cards here; just cash or check). This is also something that makes Al’s feel very homey, very welcoming and trusting, the kind of place you would want to buy meals in advance at because you know you want to come back. Often. You want to be a regular at a place like this. My food arrived about twenty minutes after ordering. And it was delicious. 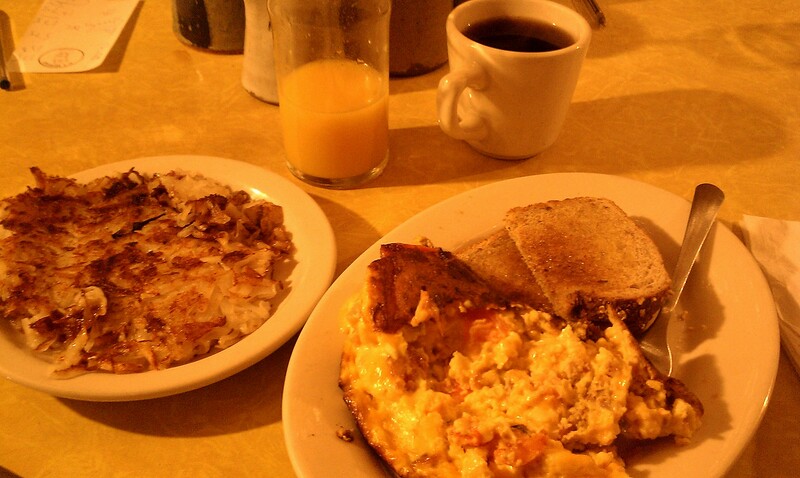 The omelet was huge, the hashbrowns crispy and hot, the coffee cup always full. It was a great kind of meal; the kind you’d expect at an aunt’s house, or a diner from the 50’s that you see on the side of an old highway. 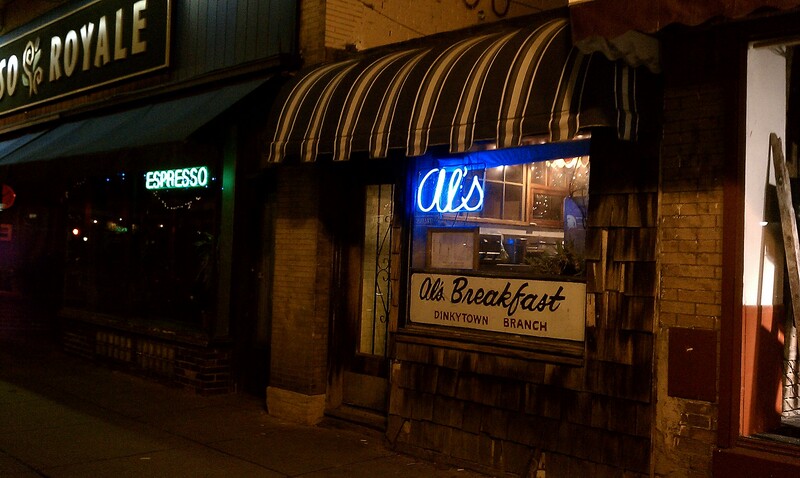 Overall, Al’s Breakfast rightly deserves it’s reputation as a Minneapolis and University of Minnesota staple. It brings a sense of no-nonsense food service to a culture that needs more of it. It is perfect for someone looking for a romanticized notion of nostalgia; a place that is divey and kind of grungy. But those aren’t faults; they are the charm. A place where grease on your food adds to the taste. When I was finished with my meal around 7:20 a.m., I paid and tipped the waitress, put my coat on, and squeezed by the new line of people waiting right behind me. New people sitting down, new people waiting in line, and more coming in as I was leaving. 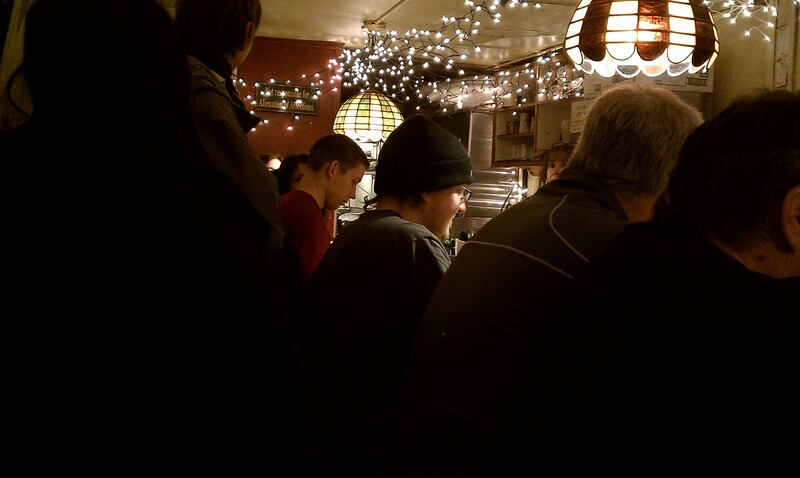 I for sure will be coming back to wait against the wall for a coveted space at Al’s Breakfast. ← What Should My FOURTH Adventure Be?